Errr... my name is Aeroria. What do YOU want? 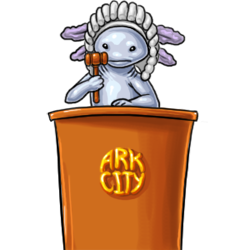 The Town Hall keeps record of every citizen living in Ark City (actually, the whole island of Ark) and also every creature stolen from the Egg Cave and beyond. The Hall also houses other administration offices that work to govern the island of Ark. The Town Hall in the City of Ark is the only place where you can legally rename your creatures. So if you aren't satisified with your creature's name, rename it here! Remember, once you change your creature's name, its old name can be used by another citizen. Creatures that are being actively traded (in a lot or offer) or are up for auction cannot be renamed. Aeroria says, "In an effort to reduce paper consumption, we have relocated creature renaming services directly to Your Cove." "Find the creature you wish to rename in your Cove, then click the icon to proceed."